The city was positively buzzing this week, with something happening almost every single night. 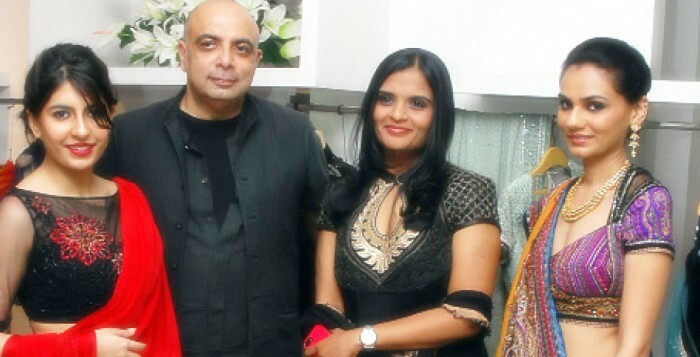 Starting things off was one king of drape, Tarun Tahiliani himself, showcasing his latest collection at Collage. Inspired by the Kumbh Mela, the line is rich, luxurious and edgy. Popular faces like Tanvi Shah and Anita Ratnam showed off a few special pieces, while all the ladies were super excited about getting to meet Tarun and having him put his personal stamp on things. Lata Madhu made sure we were all well taken care of, as she chastised guests who were not making use of this golden opportunity. While the bridal lehengas were stunning, most of the ladies opted for the draped cocktail saris. A surprise twist was the appearance of father-son duo Olivier and Elie Bernheim from Raymond Weil who were more than happy to interact with everyone and recommend pieces from their collection as well. As evening turned to night, people rushed from Collage to The Park for the launch of Ashok Amritraja��s book, Advantage Hollywood. As with all things related to the Amritraj brothers, the venue was packed to capacity, with people standing in the back. Doing the honours were his excellency, the governor of Tamil Nadu and US consul general, Jennifer McIntyre. Despite the serious nature of the proceedings, all the speakers did their best to keep things light, including snippets from the book in their speeches. The crowd couldna��t get enough of Ashok, who was called everything from a�?hero of the daya�� to a�?man of the momenta��, as he fielded all sorts of questions. Post the official launch, the rest of the evening went by with him autographing endless copies of the book. Bringing the week to a close was the finale of Masters of Food and Wine at the Park Hyatt Chennai. The week-long celebrations came to a fabulous close, showcasing talent and unusual flavours. Everything from Goan dry shrimp salad to Thai green curry, lovingly fashioned gnocchi and Norwegian cuisine was showcased through live counters, with well-paired wines. Besides just sampling, I loved that the eclectic guests got to interact with the master chefs who shared the background and the inspiration behind the dishes. A few of the ladies talked jokingly about indulging, while promising themselves to get back to their diets soon. Dublin at Sheraton Park Hotel & Towers invites presents Wolf Night featuring DJ Nawed Khan.A� Expect new age dance music from the Mumbai-based DJ, tonight, from 8 pm onwards. Entry for couples only at `2,000 per couple.